ESR | July 14, 2003 | Israel, stay out of "entangling alliances"
Israel, stay out of "entangling alliances"
In his farewell address of 1796, the first American president, George Washington, set out his vision of what would make the United States a truly great nation. He called for men to put aside party politics and unite for the common good, to create an "American character" wholly free of foreign attachments. The United States, he said, must concentrate only on American interests, and while the country ought to be friendly and open its commerce to all nations, it should avoid becoming involved in foreign wars. Although some have portrayed Washington as an isolationist, Washington did not call for isolation, only the avoidance of "Entangling Alliances." Washington said, "The great rule of conduct for us in regard to foreign nations is, in extending our commercial relations to have with them as little political connection as possible." About Europe he said, "Europe has a set of primary interests which to us have none or a very remote relation. Hence she must be engaged in frequent controversies, the causes of which are essentially foreign to our concerns. Hence, therefore, it must be unwise in us to implicate ourselves by artificial ties in the ordinary vicissitudes of her politics or the ordinary combinations and collisions of her friendships or enmities." Then he asked, "Why, by interweaving our destiny with that of any part of Europe, entangle our peace and prosperity in the toils of European ambition, rivalship, interest, humor, or caprice? It is our true policy to steer clear of permanent alliances with any portion of the foreign world..." He agreed that America should uphold already signed agreements, but then concluded, "But in my opinion it is unnecessary and would be unwise to extend them." Finally about American defense policy Washington suggested, "Taking care always to keep ourselves by suitable establishments on a respectable defensive posture, we may safely trust to temporary alliances for extraordinary emergencies." But warns of permanent "Entangling Alliances." I wouldn't have felt the need to write this article, except for the fact that the issue of "Entangling Alliances" concerning Israel, is picking up steam. Italian Prime Minister Silvio Berlusconi while visiting Israel in June said that he saw Israel, the only democracy in the Middle East, as a natural candidate to join the European Union. 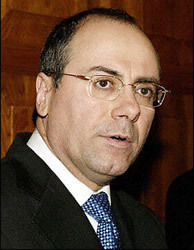 Israeli Foreign Minister Silvan Shalom has also recently expressed an interest in EU membership, as has Israeli Finance Minister Binyamin Netanyahu, both from the ruling Likud party. Israel already has a Free Trade Agreement with the European Union, but that's not good enough for some people. What caught my eye just the other day was when the current European Union president, Italian PM Berlusconi, suggested that Israel, Turkey and Russia be invited to join the EU. He stated that it would strengthen the EU politically and militarily. EU officials quickly clarified, that the policy of the EU regarding Russia and Israel has not changed, and they won't be invited to join anytime soon. But think for a moment about what Berlusconi said. Israel, its military research and development, its battle-tested troops and equipment, its willingness to fight, will strengthen Europe, that is, provide security. There is logic to what Berlusconi said. Remember this is the Europe who couldn't bring itself to take on Saddam Hussein's Iraq. Berlusconi sees things long-term, and he sees, Russia, Turkey, and Israel, all willing to use force to defend themselves unlike the current European mercantile mentality, which is always looking to buy its way out of conflict through negotiation and promises of aid these days. Yet Israelis who favor EU membership, in fact, are moving in the opposite direction. And there are quite a lot of Israeli leaders and businessmen thinking this way. Former Prime Minister Shimon Peres for example, and the Labor Party, have been big supporters of EU coziness for years. Peres' Euro-Socialist roots speak for itself. Peres has been bouncing around, trying to "Entangle" Israel for quite a while now. In the heyday of the "Peace Process" during the early 1990's he envisioned a "New Middle East", proposing a "Middle Eastern Common Market" but has since returned to his fallback position of closer ties with Europe. Even the Likud Party, who traditionally has favored closer ties with the United States over Europe, has done all that it can to prepare Israel for EU membership. Notice the Sharon government's feverish attempts to stay within the Euro-guidelines for Israeli economic policy - government deficit and the like. And although quite a few Israeli citizens, lately, have called for the death penalty for terrorist atrocities, Israel continues not to have the death penalty, because, as a few Israeli politicians have expressed it, "it would hurt Israel's chances for acceptance in the EU," (the EU outlawed the death penalty). Israelis, who see the good in closer relations with the EU, see a European political and military umbrella to protect them. Rather than bring strength to the EU, these Israelis, thinking like most of today's European leaders, are already planning on an era of "Peace" and the cutting back of Israel's martial prowess. Many of them, are moving in the direction of voluntarily giving up national sovereignty, firstly through the "Peace Process" by giving away actual territory to a Palestinian state, and secondly by joining a supra-national entity, the European Union. This does not bode well for the Jewish people's return to their ancient homeland and 2,000 year quest for national political independence! Pre-dating Washington by some 3,000 years, there is a story in the Torah of the "professional curser" Bilam (see the Book of Numbers). Seeing the Jews leave Egypt and march toward the "Promised Land", get attacked and defeat a few groups along the way, King Balak of Midian decides on a new national defense strategy. Rather than direct confrontation with Israel, he hires Bilam to curse the Jews. Bilam not wanting to admit that he's just your run of the mill "bad mouther" tells the king that he can only say what G-D tells him to. Appealing to G-D to help him curse Israel, Bilam is repeatedly told by G-D, "They are blessed". Bilam three times attempts to curse Israel, but all that comes out of his mouth are more blessings. In what traditionally has been a guiding national policy for the Jewish people, Bilam proclaims, "Hen Am Livadad Yish-kon, Uv'Goyim Lo Yit-Chashave" or "Behold! It is a nation that shall dwell alone, and shall not be counted among the nations" (Numbers 23:9). Jews really don't need to look beyond their own tradition, for policy guidelines that warn not to get into "Entangling Alliances." Traditional Jewish commentaries to these verses explain that the Jewish people get their strength and prosperity, not from alliances with other nations and cultures, but from their single-minded adherence to their own unique Torah culture - Judaism, their single-minded worship of the G-D of Israel, their single-minded control over their own land and lives, and their single-minded defense of their own interests. In a nutshell, liberty, freedom, and national independence. George Washington understood this, the United States, he said, must concentrate only on American interests. America, Washington advised, while "extending our commercial relations" with other nations, was "to have with them as little political connection as possible." He also warned the United States to be "on a respectable defensive posture." What has been good advice for America for over 200 years, and has been good advice for the Jewish people for over 3,300 years, should be good advice for the modern State of Israel as well. So, I call on Israeli leaders and the people of Israel not to try and join the EU and to stay out of entangling alliances!